I can’t say enough great things about the Cirrius team. I’ve been using CRM systems for over 10 years now, and I can say without hesitation that they are the best tech consulting partner that I’ve ever worked with. I’m slightly embarrassed to admit that I have friends that don’t seem to understand my business. So when I say that they got it, and got it quickly, I really can’t think of higher praise. Moreover once they grasp a concept, they provide insight, and creative solutions that are mindful of the overall business. Beyond that they take copious notes, manage the development process, and provide a user focused product release, complete with change logs that can be easily referenced by my team. We’re a small company with what I’m sure is deemed a limited budget, but they still make me a priority. I think that says something about their core values, and leadership. Having worked with the Cirrius team for the last few months, I can honestly say that they are one of the best Salesforce partners on the market. They are experienced and knowledgeable not only in the Salesforce platform but in cloud implementations in general and continue to play a major role in our project. The Cirrius team has been a pleasure to work with and is always willing to provide insight and will seek out the best solution for the business whilst keeping focus on delivering on time. I highly recommend Cirrius. It is has been a pleasure to work with Cirrius Solutions! They are top notch consultants who are dedicated, organized, has a good sense of urgency, and pays lots of attention to detail. They also worked VERY well with our technical and business users. He has provided exceptional service to our project and it would not have been successful without him. I hope to continue to work with him in the future. What started out as a simple refresh/update of our Marketing Intelligence and tracking capabilities within Salesforce quickly became complete revamp of current SF architecture. For a small organization struggling with tremendous growth we knew Salesforce could help, but we needed a partner well versed is identifying efficiency and bringing them to bear. Cirrius Solutions proved and still proves to be the answer. Chad and his team lead by JD have been instrumental in helping us work smarter not harder. Struggles always ensue, but the true test is working through them to find the solutions. Chad, JD and those behind the scenes as Cirrius Solutions do that day in and day out for us. The Cirrius Solutions team has been a huge help in working on a challenging, multinational Salesforce project including integration with multiple systems. Whether it be assistance with requirement elicitation and documentation, architecting solutions or assistance with testing and training they are easy to work and committed to getting it right the first time. I was hugely impressed with the enormous amount of experience that his team members have and their ability to pick up complex business processes, understand and give requirements or solution in an easy to understand organized way on time and in budget. I truly hope that I will have the opportunity to work with the team again in future projects. The Cirrius team came in and updated code that was impacting our production and established testing and feedback as the cornerstone for the continuous flow of requests they now gets from us. Their successful implementations and custom work on our objects and work flows have gotten other internal departments to ask for Salesforce updates and enhancements. This is a testament to the high quality of their work. From simple updates, to custom development and complex workflow and integration issues, Chad and his team deliver. He and his team are requirements-driven, but they don’t let requirements gathering stop them from iterating in an agile fashion. They move quickly to get a Proof of Concept produced so they can get at the real requirements that drive our business cases. They are a true pleasure to work with and I recommend them with the highest regard. His team is patient and hard-working and listen to implementation concerns and respond with effective questions. The weekly meetings are a great source of effective management and delegation. The team effort at those meetings is clear: The team is conscientious and they consistently alert us with possible options when decisions need to be made. The Cirrius team is smart, fast and extremely patient. They revamped our original customer opportunity and partner portal using Salesforce. Throughout all stages of our project, our lead at Cirrius was engaged, responsive and flexible from architecture, requirements gathering, planning, through to implementation. Not enough good things to say about this exceptional team. The Cirrius team has been great to work with. Starting with the initial contact – They explained the approach to me and has provided exactly what he told me he would. He and his team have been instrumental in our data cleanup efforts and automating some manual processes. As we have continued to use their services more, we have had some growing pains, but they jumped right in again to streamline the process so that the quality of the work would be insured. They have been a pleasure to work with and I consider them an extension of our team. As a BA, I’ve been working with the Cirrius team to elicit, refine and baseline requirements for a fairly complex release adding major benefit to a core geographical region. Working with the Cirrius team has been very easy and they’ve both shown a willingness to explain thought processes but also challenge requirements when needs be. Their technical knowledge has been invaluable since they’ve help us come to useful options to achieve an outcome. Highly recommended. This is the second time I have worked with Chad and the first time have worked with Anne. I would recommend their team to any business as they really do work with the business to implement what you need while also challenging you to ensure you are looking at the best solution. They bring a lot of knowledge and experience and help in all areas you need whether that is creating workflows, solution design right through to testing and implementation. I look forward to hopefully working with Cirrius Solutions on projects in the future. We have over 4300 users and extremely large and customized environment. Cirrius is one of the few partners we trust to analyze, design, develop, and access our production instance. In my opinion the success of a projects starts the architecture and the Cirrius architects are second to none! They have a great vision for the state of Salesforce and they really invest in understanding our needs. They were also excellent partners with our primary offshore development resources which was critical to the success of the project. The Cirrius Solutions team isreally engaged with the solution and services! They wear the team’s shirt and are able to easily understand the business needs and turn them into success stories! I am glad to work with them in Latam Thomson Reuters projects! Worked with Cirrius on two separate phases of a long term complex project and found them to be really good partners. They managed us through external integrations, new functionality builds and migrations and delivered every time. Would happily recommend them. The Cirrius team has been wonderful to work with in developing a ROM visit report for the Red Wing Regional Operations Managers. This report had a lot of steps and along the way and his team were extremely responsive, quick to resolve issues, had a lot of ideas, and was instrumental to move this along swiftly. This is a tool that will help the ROM’s at Red Wing a great deal to track store issues on Salesforce.com. I have worked with Cirrus team for almost a year for Major Releases for Latam Businesses in Thomson Reuters. I only have compliments for them. We worked with tight timelines and the implementations were deployed as expected. They have flexibility if the project needs their time, working after hours, holidays, during the weekends is a PLUS for this team. They have deeply technical knowledge and clear understanding of what are the next steps, owners and actions needed. Always willing to explain and demo to ensure everything is clear for all parties. They are positive and patient (believe me for this project it was necessary). Continue with your work – it´s exceptional! The Cirrius team identified, screened and evaluated our Salesforce.com to Micros-Retail Relate integration by leading our overall organizational needs through implementation as both our project team needs merged efforts. Providing a strategic plan leveraging resource constraints, knowledge to overcome obstacles driving delivery. It’s been a pleasure to work with their surmountable insight of Salesforce.com technical aspects. We are a Global Information Services company and worked with Cirrius Solution on our Salesforce to CPQ implementation. I highly recommend him to anyone working with complex enterprise level integration(s). They did a wonderful job of managing the entire process and is able to advise on all aspects whether it’s related to business process changes, technical developments and/or integration best practices. He is extremely knowledgeable, pays attention to detail, very timely, easy to work with and you can count on him to deliver! The Cirrus team was instrumental in assisting with a number of initiatives within our company. Ben was patient and took the time to truly understand our business and the end goals of the projects. He was particularly good at investigating/presenting the variety of ways our request could be solutioned including analysis of app exchange apps, configuration, and/or custom code options. This allowed us to choose the method of delivery, giving us a sense of ownership and technical understanding of the solution being implemented. We really appreciated the effort they made to meet our needs and budget. You will not find a better partner. The Cirrius team has been such a valuable asset to our project, they hit the ground running with everything we need them to do. Their attention to detail and ability to articulately communicate both the technical and business requirements are stellar qualities. No question about rating them 5 stars. After a painful implementation with another consultant, we had Salesforce up and running for a few months but needed some customization. The Cirrius team quickly understood our requirements. They provided great communication through the entire process and are highly responsive. I am sure that we will work with them again on future Salesforce development. We’re a small business (7 employees) with lots of integration and customization needs. After attempting to work with several other firms (both larger and smaller), we finally found Cirrius Solutions. They are responsive, incredibly smart with agile thinking about how to solve problems, and worth every single penny. We couldn’t be happier with the service we receive from them. Our only concern about writing this review is that others will find them and they will suddenly become harder to reach! But, they have such good business practices that I’m sure they will adapt to growth equally as well as they execute on every promise. The Cirrius Solutions team was wonderful! Being a service organization that support US clients on a 24/7 basis, we needed an expert team to help with our Salesforce integration. We couldn’t afford mistakes! These guys came highly recommended and we couldn’t have been more pleased. They were clear, organized and possess amazing Salesforce knowledge. All I can say is they educated us on best practices with made all the difference. They didn’t just develop a solution, they developed the right solution for our business with exceptional quality. Also a very personable group to work with! These guys are fantastic! We were using another Salesforce consulting firm but they just couldn’t get the job done. Then we brought in the Cirrius Solutions team, and wow! Things that had been broken for months got fixed in days or hours. Their approach was totally different, with a focus on business value and making Salesforce a point of collaboration, rather than confusion. Their strong understanding of best practices and relentless pursuit of perfection was invaluable. They worked with our business do get results and make your Case rollout a success. These guys will make you look good! Through our partnership with Cirrius Solutions, we have identified new areas to optimize our use of Salesforce.com. By leveraging best practices and their recommendations for our migration from Oracle to Salesforce we are recognizing more business value from our CRM investments. Their value goes beyond their knowledge of the software. Their domain experience in Sales and Service went beyond our expectations. Every exchange on this journey was positive. We undertook an ambitious project to build a Salesforce application and used the Cirrius team as our development partner. The Cirrius Solutions team were there for us every step of the way helping us build out our concept and create our go live market strategy. They has an excellent understanding of the Salesforce release process and his team of developers were very responsive throughout the process. It has been a pleasure to work with them on this critical customer facing project. The Cirrius team was instrumental in helping us with our implementation. They take the time to listen to requirements in depth, suggest the best solution(s) and are not afraid to tell you what you need to hear, rather than what you may want to hear, to ensure success. When they tell you they only hire the best Salesforce experts, they mean it. They are very, very good at what they do! 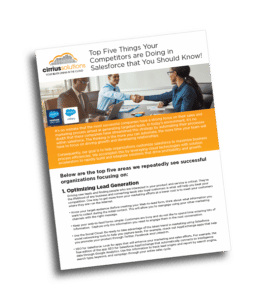 We researched upwards of ten Salesforce partners and they are the best for your money! Everyone at Cirrius who we had the pleasure to work with was very professional and the endless hours of hard work they put in went way beyond our expectations. The value is unmatched, these are the guys you want on your side when you develop our Salesforce integration. We can’t say enough about this amazing team. They truly care about their client’s satisfaction and are extremely good at what they do! I strongly recommend them to anyone with a complex development needs. The Cirrius team is very knowledgeable about SFDC and has been great to work with. They are always willing to help and work at whatever level you need help on. Their greatest strength has got to be the high energy level they brings to work everyday combined with their vast knowledge of Salesforce!! Cirrius Solutions was instrumental in facilitating a successful launch of SalesForce.com within our organization. The amount of time, effort and patience that they exemplified was above and beyond all responsibilities. Their quick response and well thought out approaches and solutions to our internal challenges helped us meet our goals and timelines. The Cirrius Solutions team would be an asset to any organization, and we were lucky to have them in our corner! My experience with Cirrius Solutions was extraordinary. I was responsible for ensuring that the integration of salesforce into our business process. With little experience using Salesforce, I wanted to make sure we found a partner who could work around our business process. I found Cirrius Solutions as a recommendation from Salesforce and it was best recommendation! These guys are great. The team at Cirrius Solutions understands complex solutions. Their communication and understanding of our organizations needs is the best we have ever experienced. The teamwork is exceptional and they went above and beyond to find solutions that matched our needs. The Cirrius Solutions team is meticulous in their work, not to mention the speed of deployments. The Cirrius team did a great job and got things done right the first time! They do an excellent job of understand what the business looking to achieve and through the development. Our Salesforce had to be customized to fit the unique needs of our business and the Cirrius team did a fantastic job. They took our ideas and implemented unique solutions using best practices. They gave us multiple options and helped pointed us in the best direction when there were multiple solutions. We couldn’t be more pleased with the way our SFDC environment turned out. Having worked with several Salesforce partners, I can say with certainty that the Cirrius team is by far the best team I have ever had the privilege to work with on any project. They take great meeting notes and are so organized. The Cirrius team has an incredible team of talented and hardworking developers. These guys to a great job! The Cirrius team has been assisting us with the implementation of Salesforce this summer and has been a great partner. They listens to our needs and offers solutions rather than telling us how it has to be done. They offers pros and cons of designing the system certain ways so we can make the most informed decisions. I would definitely work with them again. Cirrius Solutions was great in helping the Irish Setter Territory Tech Rep team create an account visit template and product demand on Salesforce.com. The info was then accumulated to create summary reports of our visits and used to put the correct product on stores shelves. They made various meetings with us to make improvements and teach us how to use the template and reports. We are using the reports to date and hopefully increasing sales on Irish Setter Product. Thanks Cirrius Solutions for your patience with our group as you rolled out SFDC. I appreciate you listening, digging in and prompting us. The work you’ve done will benefit our company enterprise-wide! As our company was maneuvering through the catacombs of our newly acquired Salesforce.com platform, we quickly discovered a need for a subject matter expert. We found Cirrius Solutions! They were instrumental in not only helping our internal developers and programmers understand the tech side of SF, but was a key player in assisting our “users” in developing an understandable and efficient use of the platform. Their team was a great liaison between the techs and the users; translating the common verbiage of users’ needs into tech talk the programmers needed. The Cirrius team was indispensable to our company in moving us from initiation through to implementation. Without their experience, kind and patient nature and knowledge, we would still be fumbling our way through the maze of SF.com.